Hevi Haul Australia Pty Ltd is a Western Australian owned and managed company, which has been proudly servicing clients with heavy haulage and oversized transport needs for over a decade. Founded in 1999 with a single truck, trailer, and dolly, Hevi Haul quickly established itself as a company that could get the job done. We have maintained that reputation to this day, delivering quality and reliable services to clients across Australia. Our three Directors have over 50 years’ combined experience in the haulage industry. When you trust your oversize transport needs to Hevi Haul, you can be confident we’ll get the job done right, first time. 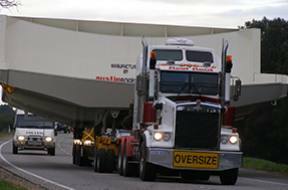 The movement of oversize loads can be complicated and time consuming. That’s why we believe in providing our clients with a single point of contact. Your Hevi Haul project manager is responsible for your project from start to finish. Your project manager keeps you informed every step of the way, so you never feel in the dark about what is happening, when, or why. Hevi Haul has the equipment and experience to deliver premium services to our clients. We operate a fleet of five prime movers, flat top trailers, drop deck trailers, and floats, with the capacity to carry loads of 190+ tonne, up to 9.5-metres wide, and 55-metres long. For loads exceeding these capabilities, Hevi Haul utilises the services of a select group of highly skilled sub-contractors, all trained and experienced in handling oversize loads. We are committed to the highest standards of safety and are duly proud of our enviable 100% safety record. Every transport project is planned with the safety of our operators, contractors, and clients in mind, and we actively encourage our employees to recommend changes in order to reduce exposure to risk. The protection of people, plant, equipment, and the environment is our number one priority, and the skills and experience of our personnel mitigate much of the risk in this regard. We also carry comprehensive insurances, including full comprehensive marine transit insurance. Hevi Haul specialises in providing services to the mining, fabrication, construction, and earthmoving industries. We are well respected within all these industries, providing a level of customer satisfaction and efficiency that keeps our clients returning to us time and again. Our clients include: Terex Corporation, Komatsu Australia, RCR Tomlinson Ltd, and Austin Engineering.